This is ,hopefully for me, an easy-peasy 2 part mold of a 1:25 scale Ford style dry sump....in layman's terms this is an one piece oil pan, oil pumps, fuel pump and starter for a Ford engine. 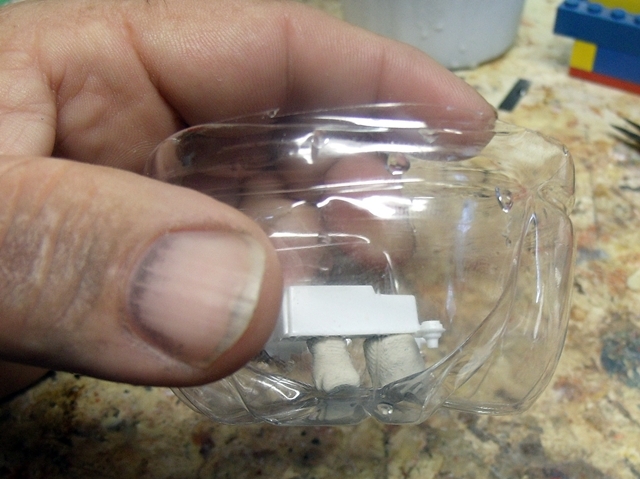 Didn't need a real big mold box, so I cut the bottom out of a plastic water bottle...for whats its worth,it's see thru, and using it for a mold , if it gets tore up demolding I can just toss it in the recycling bin......and there's plenty more where it came from. I filled the inside of the oil pan with modeling clay...I want a solid resin piece that I can work with to make a shallower pan if I want to. I made 2 pillars of modeling clay to hold the piece up off of the bottom of the mold box...these will also end up being a pouring gate and an air vent. 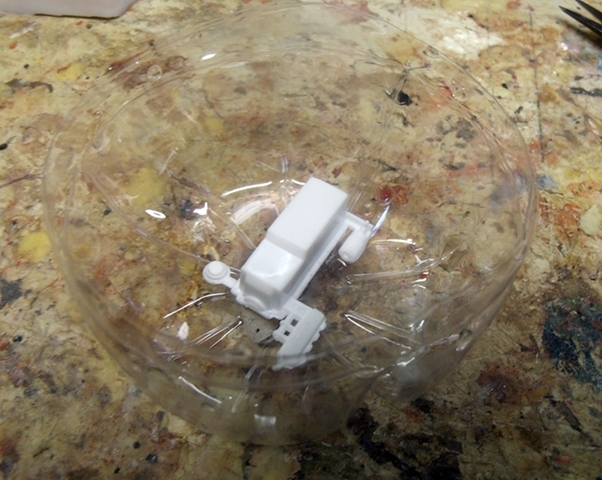 A see through mold box is one of my favorite kind, that's the first thing I choose my box materials based on. Second thing I go for is how easy I can get more of it. Keep us posted on how this one comes out. 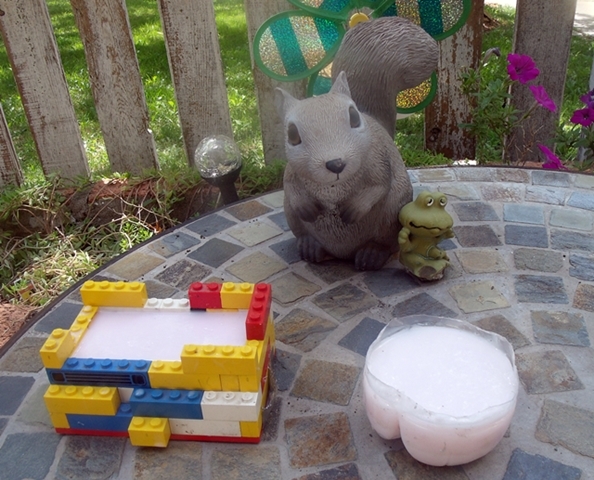 I poured the 2nd part of the 2 part molds....the Lego box is the Silver Streak platform and the bottom of the water bottle is the dry sump...I poured these around noon today, the afternoon high temp. was around 97 degrees with the relative humidity @ 56% ...its now 4:45 p.m. , they still are both outside and have both cured quite nicely to the point that I could, more than likely, be pouring resin this evening , but alas the first pitch of the Kansas City Royals Baseball game is in 90 minutes...so much for spending much time in the hobby room tonight. I'll leave these molds outside til when ever I call it an evening...looks like we might be having some Thunderstorms rolling thru during the over night hours and I don't know how rain water would effect the RTV silicone rubber if any effect at all. Used petroleum jelly for the rubber to rubber mold release...I used a cheap small paint brush to brush on the petroleum jelly to the 1st half of both molds. Full disclosure.....except for aprox. 10g for the 2nd half of the Lego box mold which was the last of the HS-2 that I had purchased direct from Alumilite, the rest is HS-3 purchased from a local Hobby Lobby.....I plan on doing a post dispelling any negative consequences about purchasing from a big box store vs. purchasing from Alumilite direct where HS-3 is concerned ...stay tuned. The planets must be close to perfectly aligned tonight.....Royals with a walk off home run to win and BOTH molds are ready for resin I am not going to press my luck this evening with pouring resin...I'll hopefully do that tomorrow. 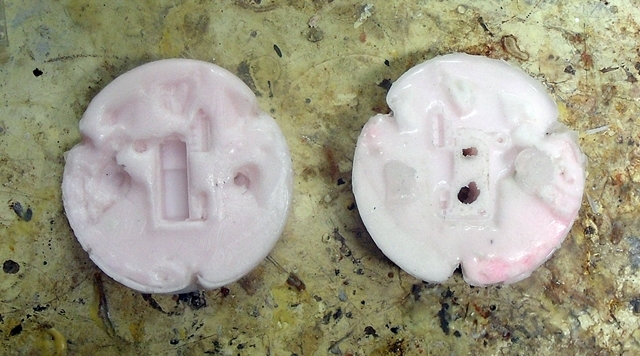 The half on the Right which was the bottom half in the mold will now become the top with its pour gate and air vent. The few air pockets around the gate and vent are no biggy...this is the top part of the sump that will never be seen since it attaches to the bottom of the engine. Used Permatex clear RTV silicone adhesive sealant to make 2 alignment lugs on the Right half.....there was absolutely no issues at all w/ brushing petroleum jelly on the Permatex silicone as the rubber to RTV rubber release. The starter (lower Right hand portion of the sump pan) did not flow right due to being restricted...I will open that area up a bit and see if that alleviates the problem, I see no reason why it won't. All of the HS-3 I've used, and 7 time out of 10 the RC-3, Amazing Putty, and Amazing Mold Rubber I've used has come from a Hobby Lobby and those were in-store purchases. But then again, the one I go to has a fairly high turnover on those so they're normally fresh (as far as I can tell) plus each product was used up quickly and I've never even checked the dates on any. As long as you go to one that has a good turnover of stock, there is nothing wrong with going to get things in a big box store. Now there are things I wouldn't buy in like a Michaels or even Walmart online but the Hobby Lobby is more "old fashioned" and is a lot better at keeping fresh stock and keeping it at the proper storing conditions. But again, that is just my experience - others might not have the same. The WIP is looking good. 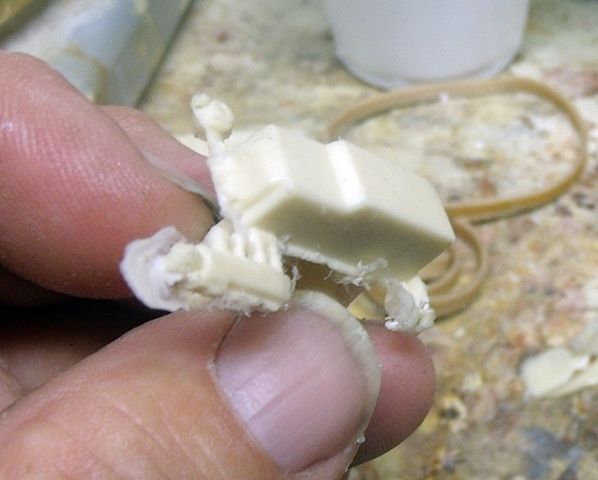 One thing I love about RC-3 is that the ratio is 1:1 and you can do the tiniest amount (1/2 ounce) and can still get a good casting or fix a casting with it if you take a few precautions. I've lined up my small molds and have fixed mistakes on a previous pour with drips from the next one. THANKS.....Absolutely no issues at all with what I purchased last week from the Hobby Lobby here in Topeka......I purposely grabbed the one from the rear on the possibility that it could be older since I doubt that the stock would get rotated...there is only 2 ea. at any given time on the shelf....trying to dispel some of the rhetoric that has been posted reference buying "old" HS-3 from a brick and mortar and having it not cure properly.....I think I'll purchase another one and just let it sit in the hobby room for a half a year or so and then use it. I've got some Amazing Putty that's close to a year old and it was also from a brick and mortar store and it still performs fine. Hobby Lobby for the most part seems to be good about keeping its stock fairly fresh and at the proper temperature.